We hosted a pre-Thanksgiving brunch at our house a few weeks ago with some of our dear friends and my parents. It was such a great time of fellowship for the adults, and play time for all of the kiddos Having a brunch is a nice change to the usual dinner party, and truth be told, breakfast is one of my favorite meals! The brunch spread was delicious that day. Everyone brought a little something to share, but since myself and my neighbor are both on a modified version of SCD, I decided to make a few SCD friendly items to make sure we had something to eat. I made an oven-baked omelet with Gruyere and ham and this Apple Spice Coffee Cake. The cake is both Paleo and SCD legal. The first time I made it I was in a hurry and reverted to the old glaze recipe we used growing up of powdered sugar and water, but now that I've made it a few more times I decided to come up with a refined sugar free glaze. It's really easy to make, and pretty difficult to screw up. If you find it's too runny, add a little more coconut cream or simply stick in the fridge for 5-10 minutes to help the oil solidify. If it's too thick, run the bottom of the blender under some hot water for a few minutes to make the oil liquify a little more. Also – make sure your cake is completely cooled before drizzling the glaze on. If you don't, the oil in the glaze will melt and the cake will just absorb the glaze instead of it hardening on top. You can even chill the cake first if you'd like to make the glaze really harden. Isn't that swirl just gorgeous?! Place a round piece of parchment paper at the bottom of a round cake pan, then lightly oil all sides with a little coconut oil. Toss together the apples and lemon juice. Set aside. Mix the flour, baking soda, cinnamon, cardamom, and salt in a medium sized bowl. Mix the coconut oil, eggs, honey, and vanilla in another small bowl, then incorporate the wet into the dry ingredients. 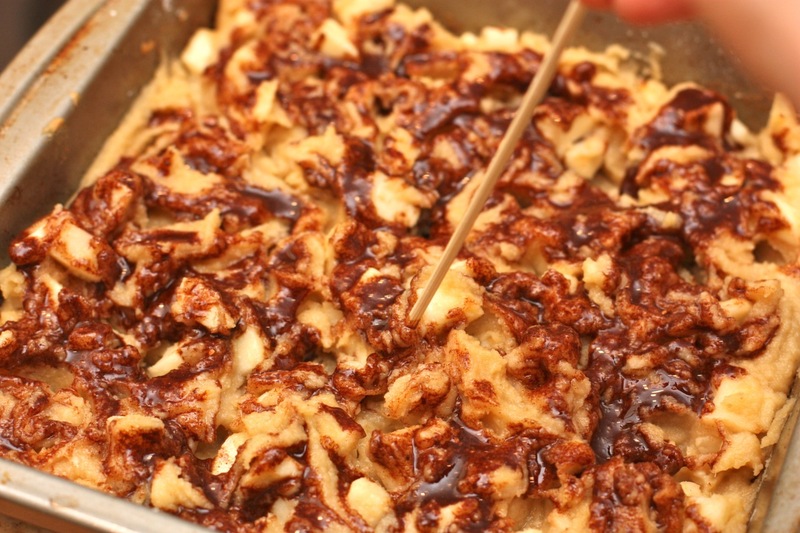 Fold in the apple mixture, then spoon the batter into the prepared pan. Use a spatula to spread it into an even layer. The batter will be pretty thick. Flip the cake so it’s right-side-up, and continue cooling either on the rack or by placing in the refrigerator. Mix together all of your glaze ingredients in a blender or small food processor. If it’s a little too runny, place in the fridge for 5-10 minutes to thicken it up a bit. Drizzle over the cake, then serve immediately or store in the fridge for 1-2 days.